Love is in the air! Are you planning the most important day of your life? Have you recently tied the knot? Are you looking to escape to the coast with your partner to simply celebrate your love for one another? If any of these situations pertain to you and your loved one, look no further than Port d’Hiver! 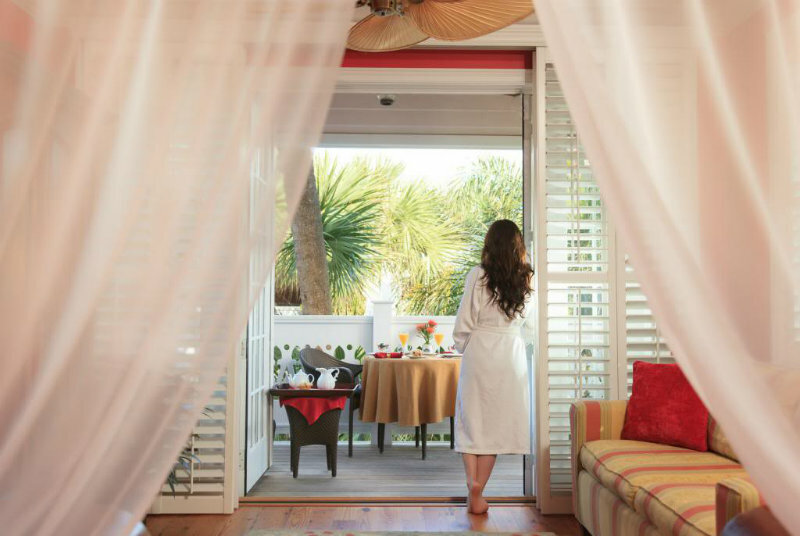 Read on to learn how to make the most of your romantic getaway at our luxurious and relaxing Melbourne Beach bed and breakfast. 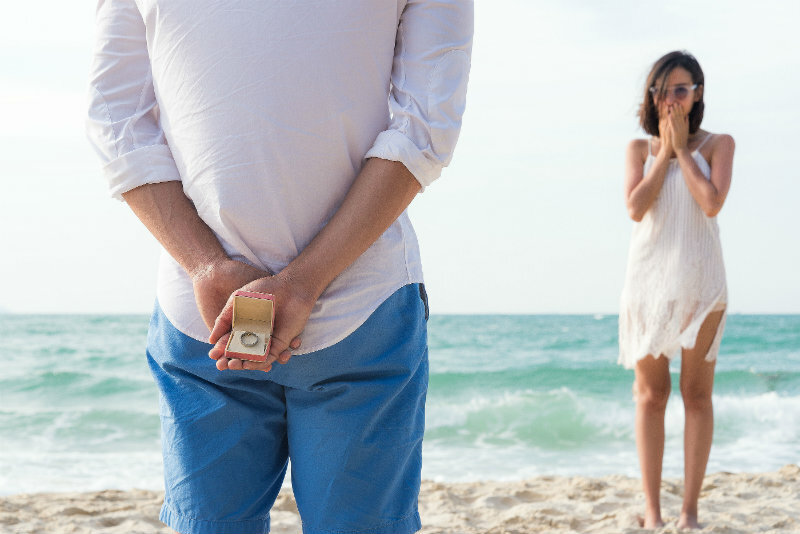 Planning that perfect moment and getting down on one knee in front of the love of your life may be a bit daunting, but we’ll take the stress out of planning the details. While we can’t get rid of those butterflies, we can make popping the question even more special with our intimate Perfect Proposal Package. Imagine asking for her (or his) hand while strolling the shores of Indian River or at sunrise on the water near our property. This package includes roses, a gourmet dinner, Champagne, and all those little details to make the moment that much more memorable. All you have to remember to bring is the ring! Escape excitedly to Melbourne Beach with your new spouse and bask in that newlywed bliss. Romance is what we do best here at our charming and intimate beachside bed and breakfast. Choose from the following three different honeymoon packages, each offering a variety of special touches. If secluded luxury and romantic relaxation is your idea of the perfect honeymoon, look no further than this package, which is all about the accommodation. The Carriage House Suite is the Port d’Hiver version of the honeymoon suite as it is the most elegant, offers the best ocean views, and is complete with the modern comforts and added amenities. Enjoy breakfast, coffee, and mimosas delivered to you in your king-sized bamboo bed each morning. Spend some extra time in your private candlelit spa tub with Shea butter bath products, chilled Champagne, rose petals, and soft music. You’ll fall in love all over again with all the special details. If you’re short on time, but want to pack in the romance, don’t waste time planning the perfect honeymoon when everything you need is right here with this package. Celebrate your love with a welcome bottle of Champagne and special turn-down service (complete with chocolate-covered strawberries), an indulgent couple’s massage, gourmet dinner, and breakfast delivered each morning. Want to extend that honeymoon period, but don’t need all the fancy frills? Pick your favorite guest room and enjoy the “little things” while spending quality time with your other half. Book this package and start making cherished memories with your new life partner in the most romantic setting imaginable. Honeymoons aren’t the only romantic occasion we do well. Consider celebrating your steadfast love for each other at Port d’Hiver with one of our special packages designed to ramp up the romance. An anniversary is meant to be just as unique as the two of you, so choose the details that best fit you and your partner. Perhaps the two of you could even make a tradition to spend each year at our romantic and beautiful bed and breakfast. 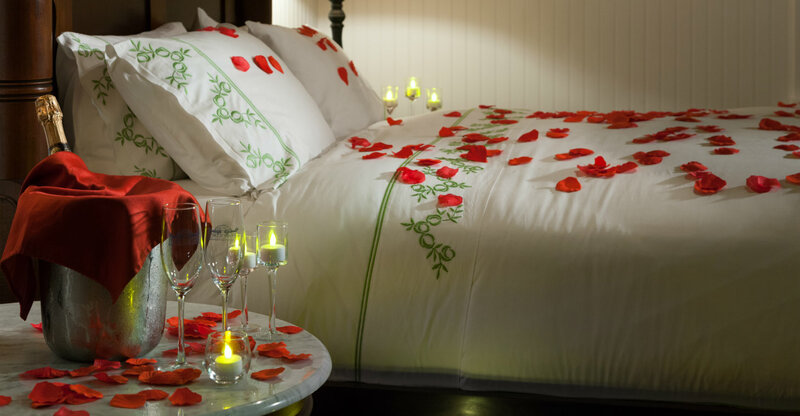 All the classic romantic details welcome you to your celebratory getaway, including rose petals on the bed, chilled Champagne, soft candlelight and music. Add a little something extra with this package. It includes everything in the Romance Package plus an unforgettable dinner for two at Djon’s Steak and Lobster House. Maybe you want to extra romance as well as some serious relaxation and rejuvenation. If so, our Tranquility Package is perfect, complete with a couple’s massage, hand-dipped chocolate-covered strawberries, and of course, bubbles (with keepsake Champange flutes for the two of you)! Adding to your happy family? Bringing a baby into this world certainly calls for a vacation! Spend some romantic time together while it’s still just the two of you with our Great Expectations Package. This one-of-a-kind experience is meant to relax mothers-to-be before the big arrival with spa treatments and sparkling cider, and even includes a custom take-home gift for the baby once they arrive home in your arms. Of course, you don’t need a milestone or special occasion to get away and spend some time with your love in a beautiful place. Make that beautiful place Melbourne Beach and spend that time away at Port d’Hiver. 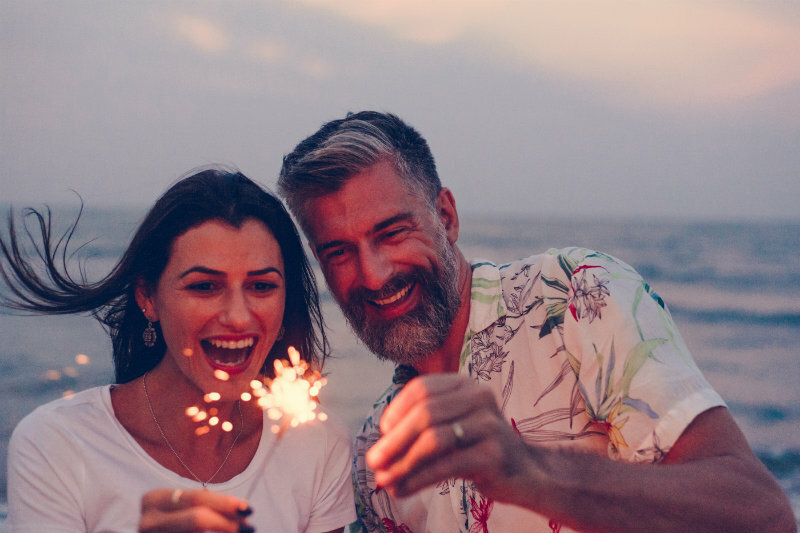 If you want to add a little something to make your getaway even more unique and memorable, but don’t need an over-the-top package, you can do so with the variety of romantic add-ons we offer. From spa treatments to food & wine to flowers and mementos, we have the tools to help you indulge and truly celebrate the moment. Offering a tranquil beach escape, Port d’Hiver is the perfect place to unpack your bags and celebrate a special occasion. Whether the two of you say or renew your vows here, or simply want to celebrate each other for a weekend or an anniversary, we take pride in accommodating your romantic getaways. Pack your bags and retreat to Melbourne Beach to walk hand-in-hand with your loved one as the sun sets, we’ll take care of the rest!